Here’s another popular dish to order at a Chinese restaurant. 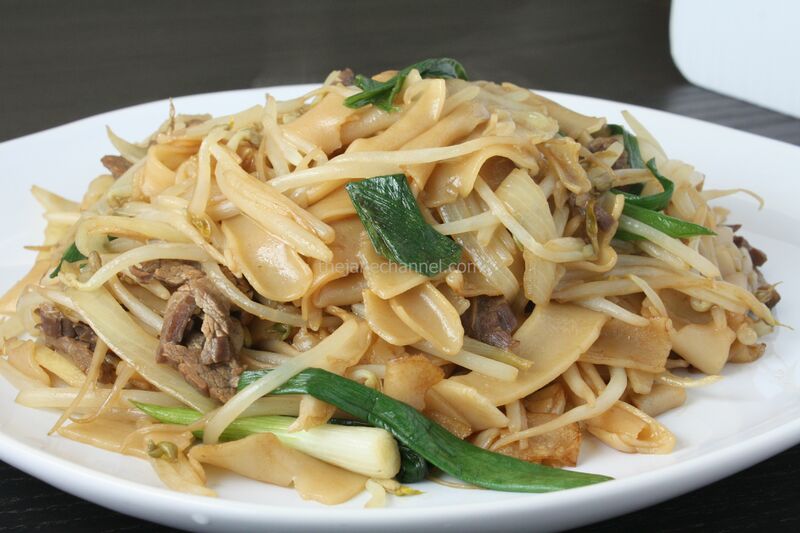 This recipe uses much less oil than the usual beef chow fun, and has no MSG added. *If you are using dried noodles, cook noodles in a pot of water until just tender, 3-5 minutes or according to package directions. Drain before frying. Rinse beef and dry with paper towel. Slice into thin strips, about 1/4-inch thick. Marinate with 1 tablespoon soy sauce, 1 tablespoon oyster sauce, 1 teaspoon sugar and 2 teaspoons corn starch for 15 minutes. Cut noodles into 1/2 to 3/4 inch strips, set aside. Heat oil in wok over medium-high heat. Add onion, cook for few minutes, until cooked through. Set aside. Bring a pot of water to boil. Add bean sprouts. Cook for 1 minute, drain and set aside. Heat oil in wok over medium-high heat. Add ginger and garlic, and cook until fragrant. Add green onions and beef, cook for 3-4 minutes, or until cooked through. Bring a pot of water to boil. Stir in rice noodles. Cook and stir constantly for 1 minute. Drain and remove. Transfer rice noodles to the wok with beef. Use spatula to constantly toss, for 1 min. Add 2 tablespoons dark soy sauce, 2 tablespoon oyster sauce. Add bean sprouts and onions slowly while tossing noodles. Mix well.